Data geek. Physics nerd. Shutterbug. Nintendo kid. Oreo addict. Eternal sleepy head. Collaboration with three other developers to create a web application with Python (using the Django framework) to allow users to explore first names from a database, and save names they like into a personal Favorites list. 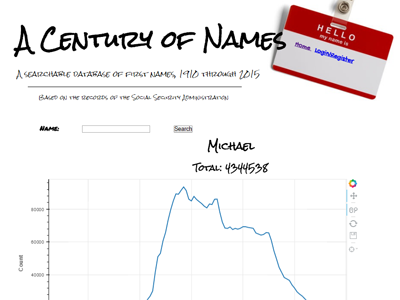 They can also view the top most popular names for a given year. The data was provided by Data.gov in CSV format, and migrated into a MySQL database for quicker access. The server uses the bokeh Python library to generate graphs to display a name’s frequency over time. 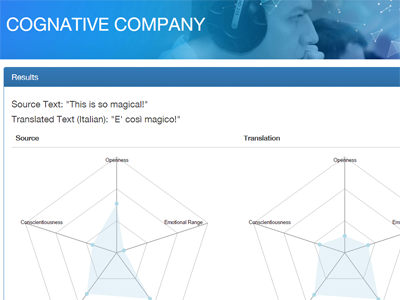 API made with Node.js and Express.js that connects to IBM Watson to translate text from English to other languages, and analyzes tone in both the source and translated language. It utilizes Cloudant NoSQL DB (based on CouchDB) to store text and translations. It has full front-end made in Angular.js, with D3.js for graphs and Bootstrap for styling. Photos and website design by Jasmine Corvin, using Foundation. If you would like to use this layout, get the source on GitHub.